Our list was widely recognised as being unbalanced in terms of age and ability going back a few years. Just thought I'd try my hand at putting something together, and seeing what people think. I'll do it by player number order. Age is a roughy, simply subtracting year of birth from 2017. For their ratings, it was done pretty quick and dirty, and is open for discussion. A bit of gut feel applied to how much impact they had this year (a combo of ability, games played, injury etc...). And then having a guess at how they'll progress in the next 2 years. Pick 10 18 0 n/a ? ? hint - don't hit the tab key (hoping to line up a table into neat columns) and then press enter. It submits your post. Nice work, although I did find it hard to identify everyone. If the guys improve as you suggest, then we could be a very daunting prospect in 2019 and beyond. I admit I found it a bit hard to read and to work out who each player was also with the nicknames and some surnames etc. I have put the data through a tool on my computer to help with the formatting. I changed the names to be the standard surnames for. I haven't changed any of the ratings, Just thought having it more readable might generate more discussion. Pick 30 18 0 n/a ? ? thanks mateinone - that looks better. Okay, so I've worked out who everybody is except the last 3. Anyone know? I mocked up a table with age & talent according to position to see where the club needed more depth, and the age profile of each position. (not sure if it uploaded, first time doing this). 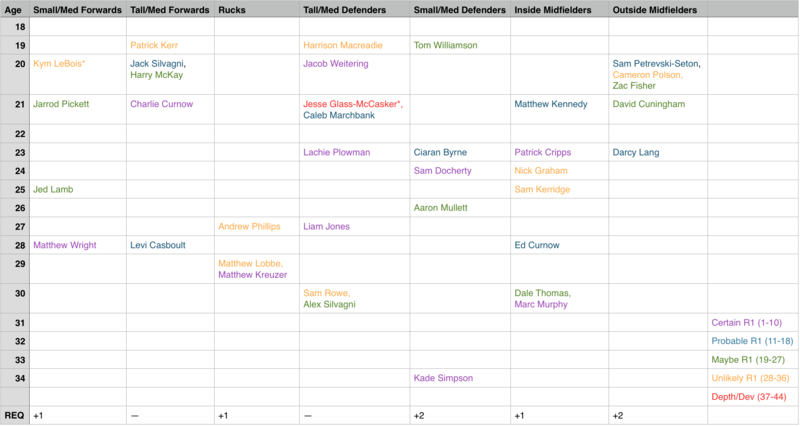 This shows the need to rookie a young ruckman this year, and add some more depth across the board. Also shows we go about 28 deep at the moment and there should be competition for spots when healthy. Age is based on how old they will be the majority of the 2018 season. Blue boy born 'n' raised. Reppin' the navy since '95. can you set a width on that image? Wow, I didn't realise how young Kerr was, in fact I thought he was at the older end of things. Now I'm even more impressed with his efforts last season! Handing out some pain, rucking while under duress! I don't think JGM is any more or less likely than say LeBios, Polson or Phillips. I think Macreadie has way more chance than the same set of players. That defensive group is virtually a coin toss based on fitness. I wouldn't have Byrne or Lang as probable, they are also maybe at this stage. For example I doubt Mullett is any less chance than Byrne. Mullett has some real tricks, and has runs on the board at AFL level is a spud side! Lang I would class as a small/medium forward in the main....didnt get onball much at the Cats for obvious reasons and is unproven enough not to be classed as a mid IMO.. So yeah this is just my opinion on our best 22/depth. Obviously there will be differing views otherwise we wouldnt have this forum for discussion. So take it as you will, use this as a base and make your own alterations to reflect your views. As we add our draftee crop, LeBois, Polson and Phillips may be moved into that lower category and others might reshuffle too. Fish, SPS and Cuners can be classed as both inside and outside because they all run through the centre but typically come off the edge of the square at centre bounces. SOS highlighted in his post-trade wrap video that Lang will be playing midfield, which is why i have put him there. but of course this is subject to change once the season begins. Nice work Pezz - interesting analysis. It also really shows the massive 'hole' in our forward line / goal kicking setup. There is one player [Jed Lamb] between 22 & 28 and he is not even an established forward. He did play a bunch of games as a defensive HFF last season, but he has 36 goals from 48 games and is still a fringe player. It's at this age that good forwards are really starting to hit their straps, and we are basically bereft in this department. We have attempted to fix the mid and back line age / experience issues, but we haven't done anything so far this off season with solving the forward line problems. It's still a huge issue for us in 2018 that we only have 4 players established across the board in that 22 to 27 age bracket. The combination of these 2 issues is likely to see us lose a few more than we win in 2018. Yes, I must add congratulations to Pezz. This is the possible the best analysis post the site has had for years!